Commonly regarded to be among history's greatest scientific minds, Linus Pauling will also forever be known as a courageous champion of peace and civil liberties. Alarmed by the use of atomic weapons at the end of World War II, Linus and Ava Helen Pauling spent countless hours over the next five decades speaking out against the dangers of nuclear fallout, weapons proliferation and the cultural effects of Cold War hysteria. Their efforts earned the Paulings both acclaim and enmity, though not often in equal measure. To some, the legacy of the Paulings' peace work remains controversial, but few will deny the duo's wide-ranging historical importance. Incorporating over 500 scanned documents, photographs, audio clips and video excerpts, this web resource features a number of rare and important items, most of which are held within Oregon State University Libraries' Ava Helen and Linus Pauling Papers. 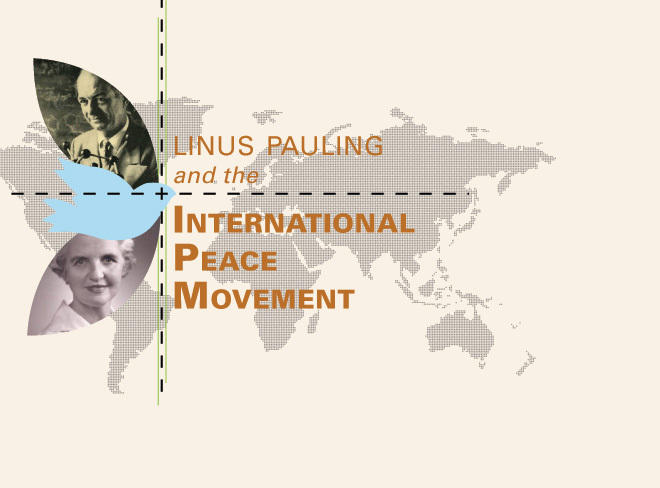 An illustrated, fifty-three page account of Linus and Ava Helen Pauling's activism for peace and civil liberties. Read Narrative. A wealth of primary sources - over five-hundred letters, manuscripts, photographs, published papers, audio-visual snippets and more - provide unprecedented perspective on the Paulings' five decades of peace work. View All Documents and Media. A detailed, illustrated look at all of Linus Pauling's personal and professional communications and activities for each day of the years 1950 and 1951. Presented in user-friendly calendar form. Browse Linus Pauling Day-By-Day.